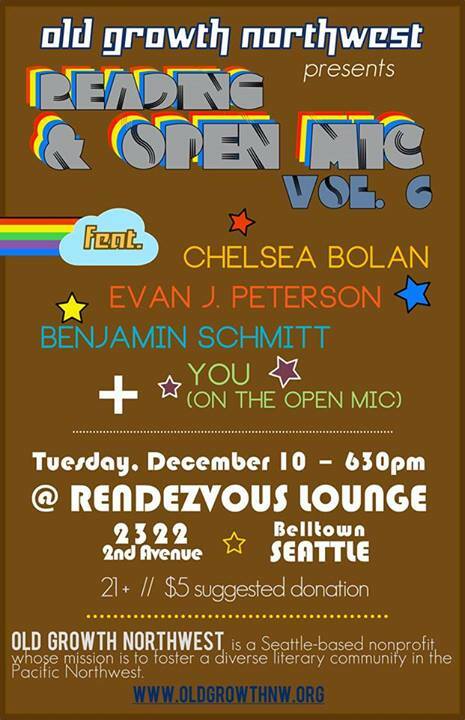 On Tuesday, December 10th at the Rendezvous in Seattle, I’ll be sharing the stage with Evan J. Peterson, Benjamin Schmitt, and whoever else comes in off the street as part of the Old Growth Northwest reading series. Old Growth NW is serious about local literature. A nonprofit that fosters creative writing in the Seattle area by offering free workshops to writers, it’s a really great thing for those of us who cannot afford to participate in a workshop otherwise. Plus, these guys are really nice. Whether you have something to read or just want to be read to, please come! Reading starts at 6:30.